The school is formally recognised as part of Canterbury University College, being granted the status of a special school within the university. A new generation of artists emerge / graduate with a strong interest in abstraction. An idea for an exhibition of work by young contemporary artists under the age of 30 is formulated and realised in an exhibition titled 'Young New Zealand Artists' at the Durham Street Art Gallery. It includes a large number of painters, sculptors and designers, mostly senior students from the School of Art including Quentin Macfarlane, Bill Culbert, Pat Hanly, Gil Hanly, John Coley and Ted Bracey. Their communal flat at 22 Armagh Street is known as 'Little Bohemia'. The School of Art achieves full status as a university department, when Canterbury University College becomes the University of Canterbury. 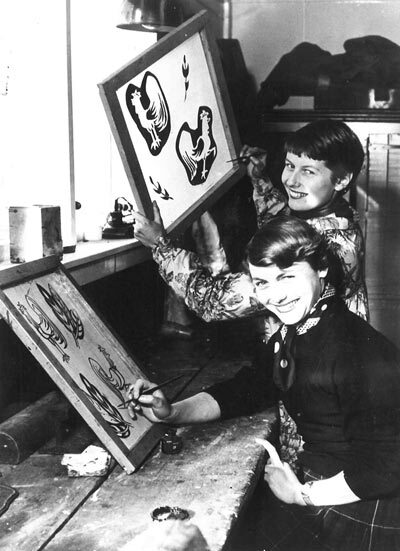 The art school's name changes to the University of Canterbury School of Art. 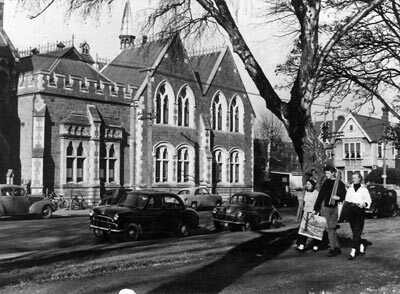 The school moves from its premises at the corner of Rolleston Avenue and Hereford Street to Okeover House on the Ilam campus. During the 1950s there were still many fruit trees and working vegetable plots around the old homestead. The School is the first department to move to the Ilam campus, but the last to gain a permanent building. Yvonne Rust organises a national pottery school at the School of Art with Patricia Perrin, Carl Vandelbosch, Marian Mauger and Mirek Smisek as tutors. Notable British silversmith H.J. (John) Simpson is appointed to staff as Senior Lecturer in Design. He becomes Head of School and first Professor of Fine Arts, 1961–1990. Lithuanian expatriate artist Rudolf (Rudi) Gopas is appointed initially as a relieving Assistant Lecturer in painting (1959), then from 1960 in a permanent position (Assistant Lecturer 1960–67, Senior Lecturer 1968–77). His interest in German expressionism is strongly influential on a generation of students. 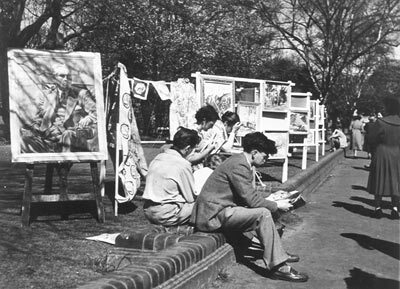 Students belonging to the school's Sketch Club held informal exhibitions of their work every year. In 1924, the School's Life Instructor Richard Wallwork was invited to critique the Club's exhibition. He valued the work produced by Sketch Club members highly, commenting that 'this work, produced outside the classes of instruction, should be made a very definitive part of the year's effort. It gave the students an opportunity to express something of himself to develop his own individuality. The student should not do work of a similar nature to that executed in the school. Although allowing as far as possible scope for individual expression, the school could not pretend to draw out the individuality of each student. The work at the school had of necessity to follow certain definitive lines, but upon this solid foundation the student will build his own methods of expression.' (The Press, 13 May 1924). 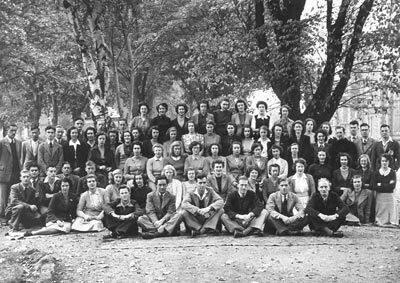 Sketch Club Group, Canterbury University College School of Art, 1953. Photograph taken in the Botanic Gardens opposite the art school on Rolleston Avenue.